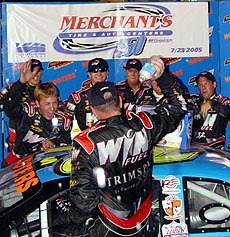 For Mark McFarland, the 2005 racing season has been a big one. 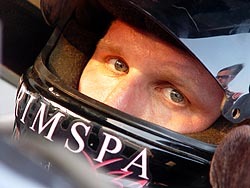 He got signed by JR Motorsports, owned by probably the biggest racing star around, Dale Earnhardt Jr., to race in the Hooters Pro Cup Series full-time and got a full-time sponsor to go along with it in WinFuel and TrimSpa. Coming from Late Model Stock Cars (and a handful of NASCAR Craftsman Truck Series and Busch Series races), the 2003 NASCAR Weekly Racing Series National Champion had big shoes to fill in 2005 and lots of expectations to live up to. McFarland took the lead after a round of pit stops by passing Mart Nesbitt on lap 141 and dominated the final 110 laps to earn his first career Pro Cup Series win. It was a win that was a long time coming for the #32 bunch. "This feels awesome," said a heated, physically worn down and not-to-talkative McFarland after the race, which was run under clear skies and very hot and humid conditions. "We’ve been waiting and waiting for this to come, but we’ve been coming up a little bit short. Mark McFarland celebrates his first career Pro Cup Serie win with his team at Soutehrn National Speedway on Saturday night. And live up to them, he did. McFarland proved to be a quick learner to the Pro Cup Series. He captured the pole, led a bunch of laps and earned his first career top-10 in just his second career start. He backed it up by earning more poles, leading a bunch more laps and being one of the favorites to contend for the win week-in and week-out. Heading into Saturday night’s race at Southern National Speedway (NC), McFarland was coming off another pole (his fourth of the season) and a career-best second-place finish in the Northern Division race at Motor Mile Speedway (VA) just a week before. In fact, he hadn’t finished worse than seventh in a Southern Division race since the third race of the year. Saturday, he didn’t even chance anything but a win for himself and his JR Motorsports team. McFarland set a steady pace at the beginning of the race while veteran Michael Ritch dominated the first half of the event. However, just past halfway, literally, Ritch’s car came coasting to a stop, the victim of a bad carburetor. “We got halfway and we started falling off,” said Ritch. “I came onto the radio and told that crew that I smelled fuel around lap 40. I knew that wasn’t a good thing because if you smell fuel, that means you are losing fuel and you probably aren’t going to make it. And I ran out of fuel. That is what happened. We had a screw come out of the carburetor and the only way we could have fixed it was to change the carburetor and we didn’t have a spare carburetor. So that is what happened. 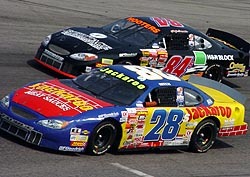 Michael Ritch (#28) was the only other driver to dominate part of the race like McFarland. So with field under caution, almost all of the lead lap cars came in for their one and only stop of the night. McFarland came into the pits second, and just like has been the case for much of the last few races, the #32 team got him out first in a big way. “The car was okay at the start,” said McFarland, who rode in the top-five most of the night before making his move to the front. “We were just slipping and sliding around, but it seemed to get gradually better as the night went on. I felt my brakes going away and right before our pit stop, the pedal went to the floor. After the race, you could see the amount of respect that McFarland has gained in the Pro Cup Series when both Huffman and Rogers came over to congratulate the first-time winner in Victory Lane. And McFarland’s bark was just as good as his bite. He was able to pull away at will over Clay Rogers and Shane Huffman, who had moved into second and third respectively. Both tried to chase down McFarland, but neither had a shot. McFarland was ready to go all day long.